I’ve been musing lately about how technology is shifting into the ‘mobile’ age. In Steve Jobs’ recent keynote speech at the WDDC, he heralded the end of the desktop era as everything shifts to tablets and mobile devices. Of course, desktops will be around for a long time and everything he says lately, needs to be taken with a grain of salt. On my morning commute to work, I see people of all ages walking around the city of Lowell, MA with their devices in hands, glowing screens in their faces, mesmerized by whatever they are engaged in – thumbs blazing on the miniature keyboards. Seems that everywhere I go, in fact, someone has a device of some sorts that they are constantly looking at. In traffic on the highway after work, I see people in their cars – despite the recent laws against texting while driving – doing the same thing. I’m sure you’ve all experienced the frustration of standing in a checkout line while the person in front of you is carrying on an enthralling conversation while totally ignoring everyone around them. The immediate gratification of the internet throughout the 90’s has paved the way for this paradigm shift. At work, my co-workers walk through the hallways with their Blackberries in their faces. In the bathroom stall next to mine, someone is checking their email and responding to it. That immediacy of information is changing the way we work, the way we learn, and sadly, the way we interact with each other. People feel more inclined to tweet something or email, poke, or Facebook a quick message to an individual with, surely, sincere intent, but without that human contact. It’s safer, dare I say more sanitized interaction. How will this change us as a people? I was talking with a co-worker about the explosion of tablet and mobile devices and pondered on the impact it will eventually have on education. Students will no longer need to open a book. Their entire curriculum will be loaded onto their iPads. How will it affect the way a class is conducted. Instead of a student raising his/her hand, they can just text the teacher or some other digital form of hand raising. Touch screen displays and devices will change the way we order something at a restaurant, or interact with a kiosk at a gas station. Apple has already changed the entire retail experience. Instead of walking up to a register, an employee can process your transaction with an iPhone. Who knows, maybe eventually, all we’ll have to do to vote in an election is download a voting app. The implications here for design though is what I’m getting at and what this paradigm shift will do to design education. With the release of CS5.5, Adobe has made authoring for tablets and mobile devices from its entire Creative Suite much easier. Of course, this falls in line with Adobe CEO Shantanu Narayen’s vision of design once, deploy everywhere. How will this impact design? I believe most designers are receiving traditional print design training through their college careers. It’s graphic designer’s and typographer’s that are teaching these classes. The basic principles of design are explained and experimentation and appropriation are used to propel the students through their portfolio classes. What’s the end result? Usually, a print portfolio. Surely, there are design schools who do have the ability to use technology and produce students with a portfolio that is something more than print. A website or an interactive Flash piece. If graphic design training continues to follow the same principles, how can students be expected to incorporate more UX design practices into their portfolios? Are we at a point where the term Graphic Design is outdated? What should a design curriculum encompass these days to ensure that students have the right foundational competencies, but yet have all of the technical competencies to meet the ever changing technological landscape? Another possibility is that students learn specific, narrow topics in design school to prepare them for a niche career? So one student could focus entirely on website design for the desktop. Another student could focus on mobile development. They would be acutely aware of all of the aspects of their respective fields and would be prepared to troubleshoot problems as they arise. Is this feasible though? Probably not. The thinking might be, ‘you can design a website, so you must be able to do develop one for mobile use?’ Maybe graphic design curriculum becomes more of a liberal arts study. More exploratory in nature until the student finds their interest and holds on to it. There’s no question though, that as with the rise of desktop publishing changing graphic design behavior, tablet and mobile development will change it again. Are we ready for that change? 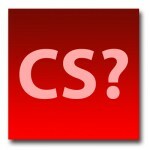 So Adobe recently released CS5.5 without a lot of hoopla. This is a mid-cycle release which focuses primarily on mobile and tablet publishing. We all are familiar with the promise to publish to the iPhone from within Flash CS5 that quickly got crushed by Apple, then slyly approved of later. Well now the floodgates have opened and Adobe has zeroed in on making their apps capable of delivering content to the iPhone (IOS devices) and Android market. Flash, despite the fact that SWF files cannot play on the iPhone still, can publish for the IOS platform now with a new template specifically for that platform. 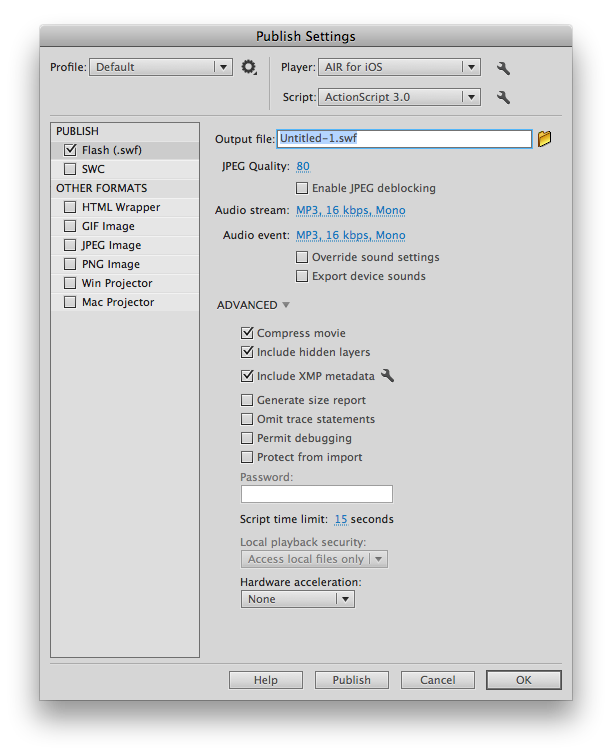 Essentially, Adobe is wrapping the Flash content in an AIR application with all of the necessary Objective-C language to play well with an IOS device. The same is true for Android development. You can reliably test your applications in Device Central and port your content directly to connected devices. It’s much easier to do this now than it ever was before in Flash. As I mentioned before, you can test the application in Device Central by going to Control > Test Movie > In Device Central. You can also test directly on the USB connected device. Another feature that’s been added is the ability to convert vector based clips into bitmaps. At first, I thought this was a feature that was only for improving the performance of complex vector graphics – which Cache as Bitmap already handles. In fact, this feature is for mobile devices that can’t handle vector graphics. I wonder if we’ll see SVG and canvas support in future versions, but I doubt it. In applications like Photoshop and Illustrator, it’s easy to copy a layer. That functionality didn’t exist in Flash until this version. You can now Cut, Copy, Duplicate, and Paste layers. I for one, have been waiting a long time for this feature. Sure, you can copy and paste frames, but the ability to copy layers from one FLA file to another is great. Duplicating layers will be a huge time saver for animation. If you tried the Bones tool in CS5, you probably got a little frustrated. OK, well maybe frustrated a lot. 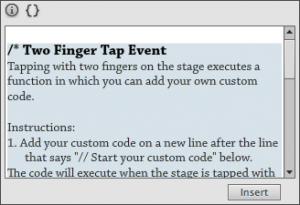 Chris Georgenes did an excellent job explaining the hidden reasons why the tool didn’t work the way most people thought it would in his book How to Cheat in Flash CS5. One of the techniques he used was to use an empty movie clip as a kind of global anchor to pivot the whole armature on. The other technique he mentions is creating sets of armatures in separate movie clips. In other words, you don’t necessarily want to create an entire skeletal armature system on a character, but maybe connect certain parts together that make sense when it comes to moving them. New in CS5.5 is the ability to pin a bone down so that it doesn’t move, freeing up other appendages to move around on the axis of that bone. Sure, you could’ve done this before by constraining a bone, but I could never figure out the right degree angle settings for the kind of constraints needed for an elbow (as an example). This will be a big help specifically with neck bones and other difficult armatures than require a bone, but not necessarily a motion on that bone, only the ones connected to it. The code Snippets Panel has a new HUD on it for each snippet. There are also new snippets for mobile devices, like swipes and gestures. What’s annoying about the HUD is that after you open it, it doesn’t want to go away until you click on some other part of the interface. Still, it’s a nice reference and there are some code examples in there to get you started. Each snippet is heavily commented to show you what is static and what needs to be changed. TLF text on its own is great. Used in conjunction with external classes or with loading SWF files doesn’t work (as chronicled here), until now. The problem really wasn’t with the TLF engine, it was Flash’s Loader class and a little-know bug caused by its internal preloader. This has actually prevented me from using TLF in any of my projects. Adobe put out a temporary fix called SafeLoader which worked for some people and not for others. The solution in CS5.5 is a new Loader class called ProLoader. I guess the name SafeLoader implied that the previous Loader wasn’t safe, so they went with ProLoader instead. You can actually see the ProLoader in action by using the Click to Load/Unload SWF or Image snippet in the Snippets panel. I’m pleased to tell you all that ProLoader does indeed correct this major issue and now we can explore TLF, which has its own set of problems. Adobe did spend some time improving TLF for this release by adding a tab ruler and support for style sheets. There’s just other things that developers need dynamic text to do that TLF maybe isn’t built for. The ProLoader class works and behaves just like it’s stepchild the Loader class, there are just some methods and properties in that class that specifically handle the preloader/TLF issue. Nicely done Adobe. Another small enhancement is Incremental Compilation, which caches parts of your SWF file every time you test the file so that you don’t have to wait forever for each incremental test. That will certainly save time. Adobe’s push into the Mobile/Tablet market is smart and timely. It comes on the heels of the whole Steve Job’s open letter on Flash thing and it’s in line with Adobe CEO Shantanu Narayen’s vision of Publish once for multiple platforms. InDesign and Dreamweaver also have a lot to offer in these areas. The ProLoader is the fix that I’ve been waiting for the most and will have the most impact for me. The lingering question, of course, is still what will people use Flash for now that HTML5 and CSS3/jQuery can do a lot of its tricks. I, for one, strongly believe that it has its place on the web and now on the mobile/tablet space. Adobe really needs to bolster the Flash platform and continue to improve it to show developers what’s possible with those tools. It will be an uphill battle, but if they can position Flash just right, it will be around for a long time. So recently Adobe announced at the end of their 1st quarter, that the next version of the Creative Suite will be rolled out in April (April 11) ref: InDesing Secrets. Of course, they are being tight-lipped about it and no one’s certain if this will be a minimal upgrade or something more substantial, since it doesn’t fall into line with their normal production cycle (ref: InDesign Secrets). Seems odd that they would have to add a tool for HTML5 and CSS3 when Dreamweaver already does all of that. I’m sure that’s not what they are talking about though. Since HTML5 came out, there really isn’t a good toolset out there for working with the Canvas object or to create CSS3-based animations with a tool, other than just hand coding it (correct me if I’m wrong). I’m pretty happy with CS5, but it’s still buggy and I do experience limited, yet frustrating, crashes and odd behaviors. At the most, we can hope for more bug fixes mixed in with some extra web trickery in all of the applications. I’m personally hoping for better font performance in Flash. Since Adobe prides itself on it’s own font technologies and has a good footing with them in Illustrator and InDesign, it’s so different in Flash. The inclusion of TLF (Text Layout Framework) in CS5 was supposed to be the answer to so many issues, but it falls short when it comes to actually using it with Actionscript. I’d also love to see improvements in the 3D filter in Illustrator. There’s so much potential to really boost that part of the application to develop rich product renderings and such, but the interface is pretty limited. Live Trace, while a good tool for refined images, really needs an overhaul too. 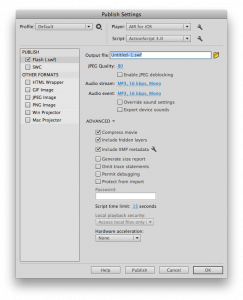 I’m sure on the InDesign side, we’ll see more of the features that Quark has been rolling into it’s latest release, with advanced ways to publish to portable devices of various kinds. Of course, we’ll probably have to shell out a few hundred dollars more and it will probably come in different packages, but it’s something to look forward to. What are you hoping for? Text boxes that behave like those in InDesign. You can link text boxes together so that text will flow throughout them. Spring feature of the Bones tool. Allows you to set a strength and dampening setting so that the bones objects bounce and behave like they are reacting to an external force. There’s a publish setting in Flash to publish to the iPhone. I’ve talked about this before, but Apple isn’t going to allow this moving forward. CS4 has been around about nine months now and so everyone should’ve upgraded, right? Well, not exactly. The adoption rate has been a little slow this time ‘round, given the economy and for some, a lack of compelling reasons to upgrade. Adobe has been on a spree lately, getting the CS4 word out there and working with their evangelists to create compelling reasons to upgrade. So let’s say that you did upgrade and now you’re in a situation where you are working with a client that is still in CS3 land. Inevitably, you’ll run into compatibility issues. This article will help you navigate that particular topic. InDesign has had a built-in, cross-product file format since CS2. 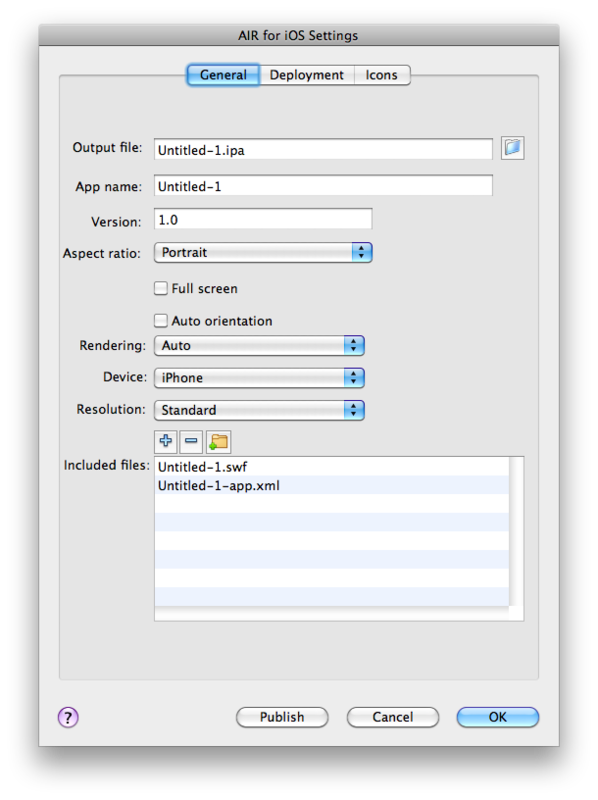 An INX file is basically an XML file that describes how an InDesign document has been created and all of its linked assets. In InDesign, when you go to File > Save As, you won’t be able to save down to CS3, you can only save as a CS4 document or template. 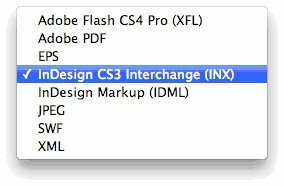 However, if you go to File > Export, you’ll find the InDesign CS3 Interchange (INX) file format. Export as this file format to send to anyone who’s on CS3. A word of warning, linked assets and fonts are not bundled with the INX file, so you’ll have to send those along as well. 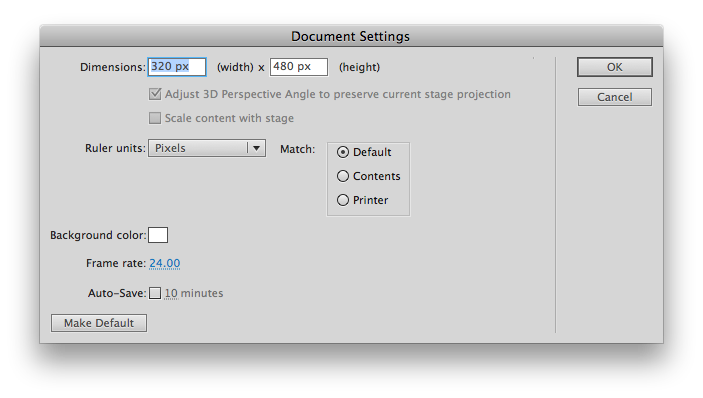 In InDesign CS3, simply go to File > Open and open the InDesign file. 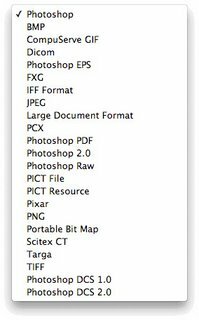 Illustrator has also always featured a cross-compatibility file format in the Illustrator Save Options dialog. 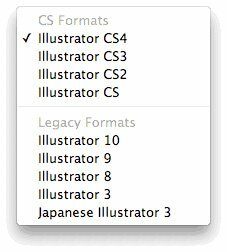 You won’t find a Illustrator CS3 option under File > Save As, but you will find multiple formats in the Options dialog. As you can see, you can go back as far as Illustrator 3. A little warning here is that some of the transparency effects and the new gradient transparency feature will not be backward-compatible. 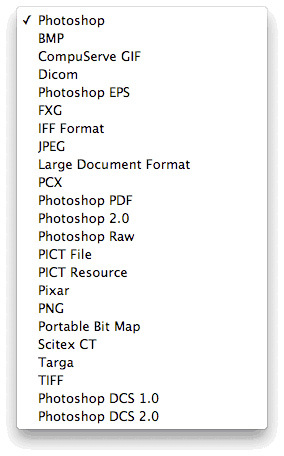 Also, since Illustrator CS4 supports multiple artboards, opening a file like that in CS3 will be problematic. You may have to save each artboard as a separate file. Again, certain features will not be supported in CS3, but a majority of the file will be useable. Flash actually does allow you to save down to the CS3 format. Just choose File > Save As and you can use the CS3 file format. What you’ll lose here is the Motion Tweens you create in CS4 will be translated into Classic Tweens in CS3. ActionScript hasn’t changed much (Flash is still using AS3), so there’s not much to worry about there. Your easing values might be different, since CS4’s Motion Editor is more robust than simple easing in CS3. You may find people still on CS2 or on other versions of the Creative Suite. At that point, backward-compatibility becomes more difficult. There may be other approaches of working with older documents. 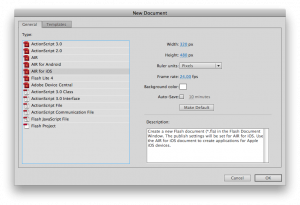 For example, InDesign allows you to place InDesign files and PDF documents. So you may be able to import older files into CS4 as a starting point. Going backwards though, not so easy. As Quark struggles to stay alive, they release a new Guide to Integration with the Creative Suite.